It's costly, risky and dependent on technologies that have yet to be fully developed. A decades-long journey filled with unknowns lies ahead for Japan, which took a small step this week toward decommissioning its crippled Fukushima nuclear power plant. Nobody knows exactly how much fuel melted after the March 2011 earthquake and tsunami knocked out cooling systems. Or where exactly the fuel went—how deep and in what form it is, somewhere at the bottom of reactor Units 1, 2 and 3. The complexity and magnitude of decommissioning the Fukushima Dai-ichi plant is more challenging than Three Mile Island or Chernobyl, say experts such as Lake Barrett, a former U.S. regulator who directed the Three Mile Island cleanup and now is an outside adviser to Fukushima operator Tokyo Electric Power Co.
One core melted at Three Mile Island in 1979, versus three at Fukushima, and it didn't leak out of the containment chamber, the outer vessel that houses the reactor core. At Fukushima, multiple hydrogen explosions caused extensive damage, blowing the roofs off three reactor buildings and spewing radiation over a wide area. Chernobyl was a worse accident in terms of radiation emitted, but authorities chose an easier solution: entombing the facility in cement. At Fukushima, TEPCO plans a multi-step process that is expected to take 40 years: Painstakingly removing the fuel rods in storage pools, finding and extracting the melted fuel within the broken reactors, demolishing the buildings and decontaminating the soil. "This is a much more challenging job," Barrett said during a recent visit to Japan. "Much more complex, more difficult to do." Also, water must continuously be channeled into the pools and reactor cores to keep the fuel cool. Tons of contaminated water leaks out of the reactors into their basements, some of it into the ground. Uncertainty runs high as Japan has never decommissioned a full-size commercial reactor, even one that hasn't had an accident. TEPCO has earmarked about 1 trillion yen ($10 billion) for the decommissioning, and says it will agree to Prime Minister Shinzo Abe's request to set aside another 1 trillion yen to fight water leaks. The government itself has contributed or promised 145 billion yen, and is expected to step up its involvement in the years to come, following criticism over its lack of support and growing concern that the technical and funding challenges are beyond TEPCO's capabilities. 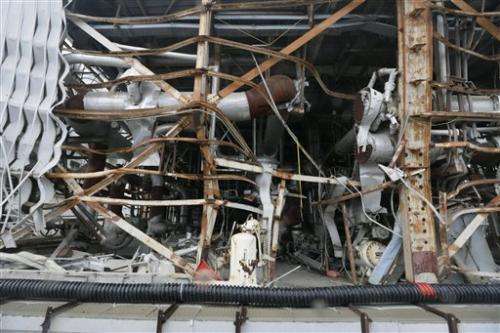 TEPCO began removing fuel rods Monday from a storage pool at Unit 4, whose building was severely damaged but didn't have a meltdown because the fuel had been removed from the core for maintenance. In an underwater operation, 22 of the 1,533 sets of fuel rods in a pool on the building's top floor were transferred to a cask that will be used to move them to safer storage. By 2018, the utility hopes to remove all 3,100 fuel assemblies from storage pools at the four damaged units. After that would come the real challenge: removing melted or partially melted fuel from the three reactors that had meltdowns, and figuring out how to treat and store it so it won't heat up and start a nuclear reaction again. "This is an unprecedented task that nobody in the world has achieved. We still face challenges that must be overcome," said Hajimu Yamana, a Kyoto University nuclear engineer who heads a government-affiliated agency that is overseeing technological research and development for the cleanup. Closing the holes and cracks in the containment vessels is the biggest hurdle in the decommissioning process, experts say. Every opening must be found and sealed to establish a closed cooling system. Then, under the current plan, the next step would be to fill the reactor vessels with water and examine the melted fuel. Because of still fatally high radiation levels, the work will have to rely on remote-controlled robots for years. Scientists are developing robots to spot leaks, monitor radiation levels and carry out decontamination. They are also developing robots that can detect holes and fill them with clay. Among them is a camera-loaded swimming robot that can go underwater to spot holes and cracks, and another one that can go into ducts and pipes. Computer simulations show the melted fuel in Unit 1, whose core damage was the most extensive, has breached the bottom of the primary containment vessel and even partially eaten into its concrete foundation, coming within about 30 centimeters (one foot) of leaking into the ground. "We just can't be sure until we actually see the inside of the reactors," Yamana said. "We still need to develop a number of robots and other technology." Three Mile Island needed only a few robots, mainly for remote-controlled monitoring, sampling and handling debris, as the melted fuel remained in the core. Manned entry was possible a little more than a year after the accident. Some experts say Japan's current decommissioning plan is too ambitious. They counsel waiting until contamination levels come down, and even contemplate building a shell around the reactors for the time being, as at Chernobyl. "I doubt if Fukushima Dai-ichi's full decommissioning is possible. Its contamination is so widespread," said Masashi Goto, a nuclear engineer who designed the Unit 3 reactor and now teaches at Meiji University in Tokyo. "We should not rush the process, because it means more exposure to workers. Instead, we should wait and perhaps even keep it in a cement enclosure." Others say the Chernobyl solution wouldn't be effective, noting that the reactor was a different type without massive water leaks. Developing expertise during the operation is also important to Japan, which has dozens of reactors that face eventual retirement and is considering turning decommissioning into a viable business at home, and possibly in a growing global market. "If you just put concrete over this, groundwater still will be flowing and things like that, and you have an uncontrolled situation," Barrett said. "I just don't see that as a plausible option." Only a small test reactor had been successfully scrapped in Japan, with five others now being decommissioned—two experimental and three commercial. The furthest along is Tokai Power Station's No. 1 reactor, which is 15 years into a planned 22-year process. Japan also has to worry about future natural disasters. "There will be many more earthquakes and typhoons," Goto said. "I hope these plans won't fail, but we might just have to pray."